Ocean of Letters is a remarkable history of imperialism, language, and creolization in the largest African diaspora of the Indian Ocean in the early modern period. 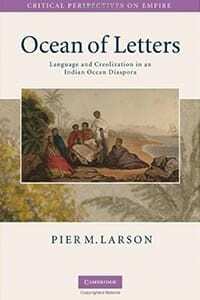 Ranging from Madagascar to the Mascarenes, the Comores, and South Africa, Pier M. Larson sheds new light on the roles of slavery, emancipation, oceanic travel, Christian missions, and colonial linguistics in the making of Malagasy-language literacy in the islands of the western Indian Ocean. He shows how enslaved and free Malagasy together with certain European colonists and missionaries promoted the Malagasy language, literacy projects and letter writing in the multilingual colonial societies of the region between the seventeenth and mid-nineteenth centuries. Addressing current debates in the history of Africa and the African diaspora, slavery, abolition, creolization and the making of modern African literatures, the book crosses thematic as well as geo-imperial boundaries and brings fresh perspectives to Indian Ocean history.